Michael Jacobson dribbles a ball during Iowa State Men’s Basketball Media Day. 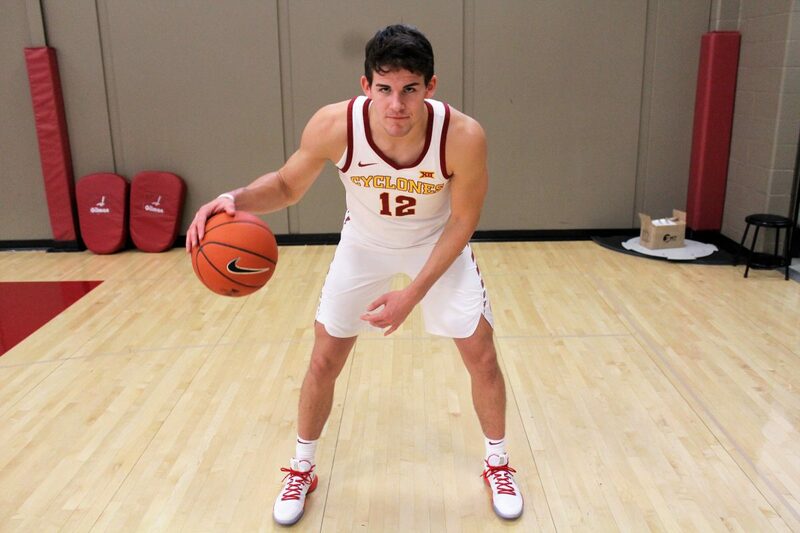 Because he transferred from Nebraska, Jacobson will take the floor for the Cyclones for the first time this season as a junior. AMES – Well, it was certainly a lot better than last year’s home opener. Iowa State jumped out to an early lead on Tuesday at Hilton Coliseum against Alabama State. Steve Prohm‘s struggled mightily in the middle, including a nearly six-minute stretch towards the beginning of the second half in which the Cyclones scored just four points. Then, they rode three freshmen and two sophomores on a 19-5 run towards a 79-53 season-opening win. On the night Talen Horton-Tucker made his much anticipated Iowa State debut, it was Tyrese Haliburton — the “other” freshman guard — who stole the show. 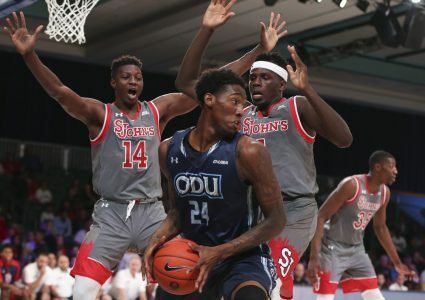 The 6-foot-5 Oshkosh, Wis. native scored 12 points on 5-of-6 shooting while adding four assists, four steals and three rebounds. Junior forward Michael Jacobson — another Cyclone making his Hilton Coliseum debut — scored a team-high 17 points and grabbed seven rebounds, also a team-high. Lindell Wigginton did Lindell Wigginton things scoring 13 points on 5-of-11 shooting. Marial Shayok, also making his Iowa State debut, scored 14 points on 6-of-10 shooting, including eight of the team’s first 10 points, and grabbed six rebounds. As a team, the Cyclones shot 47.8 percent from the floor and 38.5 percent from 3-point range with 10 makes. They held their opponent to less than 60 points while Prohm mixed and matched a plethora of different lineups. It was exactly what a season opener should be and was a far cry from last year’s season-opening blowout loss to Missouri. Oh, by the way, those same Tigers will be in Ames on Friday and there is little doubt these Cyclones remember last year’s drubbing in Columbia. 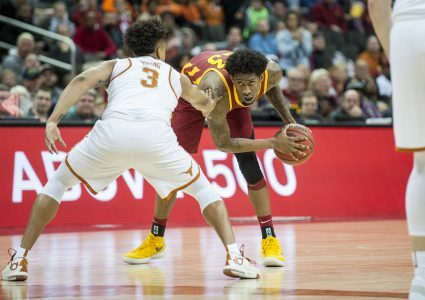 Iowa State played its first game of the season — and will subsequently play the first month of the season — without two crucial pieces of its frontcourt. Star sophomore center Cameron Lard and junior forward Zoran Talley are both suspended until at least December, Prohm announced after the game. Lard’s suspension comes as no surprise following a string of legal issues last spring that ended with him spending the summer away from the program in a wellness facility. The 6-foot-9 Louisiana native averaged 12.6 points and a team-high 8.1 rebounds per game as a redshirt freshman last season and was an honorable mention preseason All-Big 12 selection entering the year. 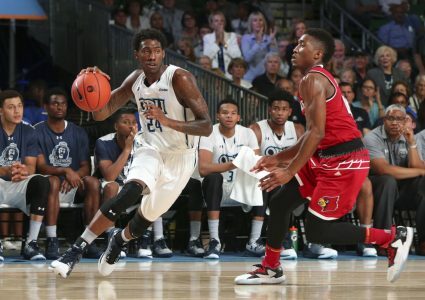 Add on top of that losing Talley, who averaged 7.5 points and 4.0 rebounds last season after transferring from Old Dominion, plus the loss of junior Solomon Young, who is out six-to-eight weeks with a groin injury, and Iowa State’s frontcourt is suddenly a lot more thin than was previously expected entering into the season.